We will be releasing several items on October 1 at the Emporium. Guests and Annual Passholders will find “I Was There” shirts. We will also have a limited edition pin (edition size of 3,000), and a limited edition retail MagicBand (edition size 4,500). I hope to see you at Magic Kingdom on October 1! 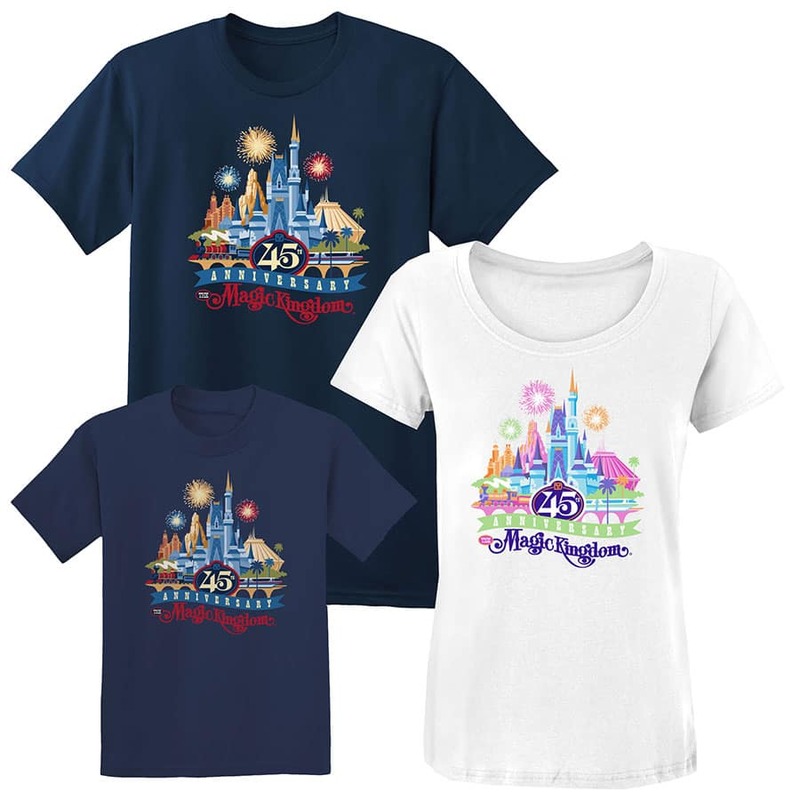 Hi – I had seen some of the announcements of the 45th Anniversary merchandise and assumed that it would be available for the whole anniversary year. We are going in a couple of weeks and I was assuming we’d be able to get t-shirts. Reading this more closely it looks like some were only available 10/1-10/9 online. Are there plans to release these again? I was specifically looking at the navy with the Mickey 45th logo and the blue with the Alice and tea cups logo. Thanks for your help! Would you please advise if there a 45th anniversary Cel being offered from the “Ink & Paint Cel Program”? There was one for Disneyland’s 60th but I cannot find any info on if there will be a cel for the 45th WDW anniversary? Thanks! Hi Steven, will there be a Duffy Bear like Hollywood Studios had? Hi Steven, First time trying to catch limited edition items. 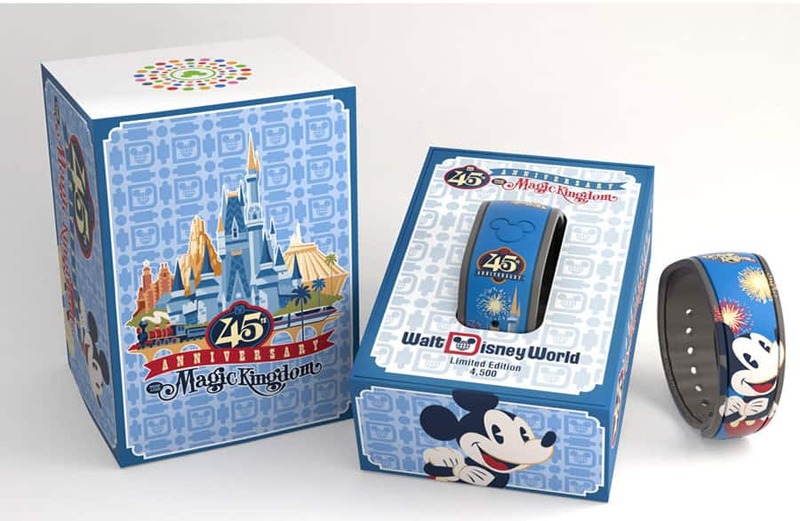 Are the pins and magicbands something I need to be there for opening on September 1st or will I be able to purchase if I show up in the afternoon? What’s the trend for limited edition items I guess? Thanks! @Tyler – Limited edition items are sold on a first come, first serve basis. It’s difficult to for me to say how popular these items will be with guests visiting on October 1. Unfortunately, I can’t guarantee how long these items will last. Will they have a women v neck t shirt ? Is there a 45th Anniversary ‘Key” like was released for Disneyland’s 60th? I am really love collecting the series and don’t want to miss out! 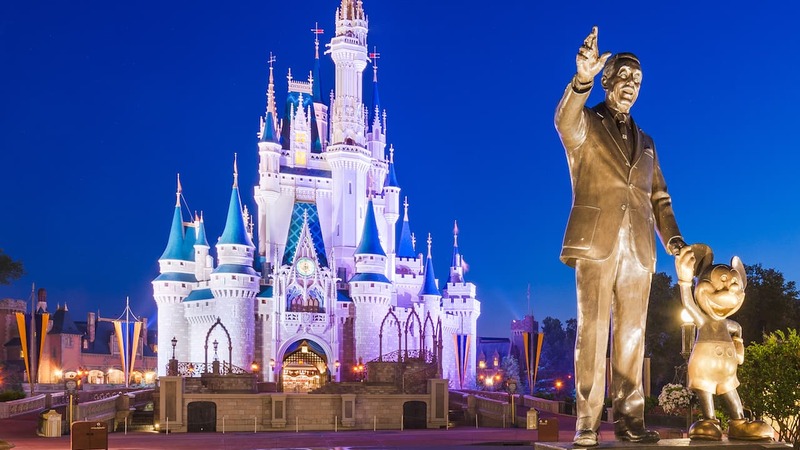 @Mary Elias – There will not be a Magic Kingdom 45th Anniversary key this year. I’m sorry I don’t have better news for you. Will there be a special Star Wars Droid Factory for the 45th? Cause you have R2-B00, R2D60? Anychance we’d see a R2D45? @Matthew – Good question. I’ll have to check with the merchandising team. Stay tuned. Will there be any statues or figurines. The blog never spotlights these items. @Brian – I’m not aware of those items. Hi Steven, Thank you for helping choose such great merchandise. We love your videos with delivery guy! Do you have any plans to be in the park on October 1st? We are looking forward to the merchandise and hopeful that there will be a birthday celebration full of surprises. My dad turns 70 that weekend and we can’t wait to celebrate with him! @Lisa – You’re welcome! Thank you for reading these stories. Please give your dad my regards and wishes for a wonderful birthday. Will there be any framed pin sets or non-announced items? @John – There will not be a framed pin set. I’ve pretty much shown all of the items that will be released on September 22 and October 1. There will be a box of chocolates but it’s part of the regular logo program assortment. If there are other items planned in the coming months, I’m sure I’ll have additional Disney Parks Blog articles about them. How much is the Magicband and the Pandora 45th Charm? Any chance we might get some attraction vehicle replicas like we did for Disneyland’s 45th and 50th anniversaries (i.e., Kevin Kidney & Jody Daily designed items)? @Alessandro – I’m not aware of any plans for such items. Sorry. In your previous video, you had the mugs and anniversary tees with Mickey on one and Tink on the other. You also had the shirt with attraction logos. Are those still going to be available or have they been replaced by the designs pictured above? @Lauren – The previously shown tees will be released on September 22. 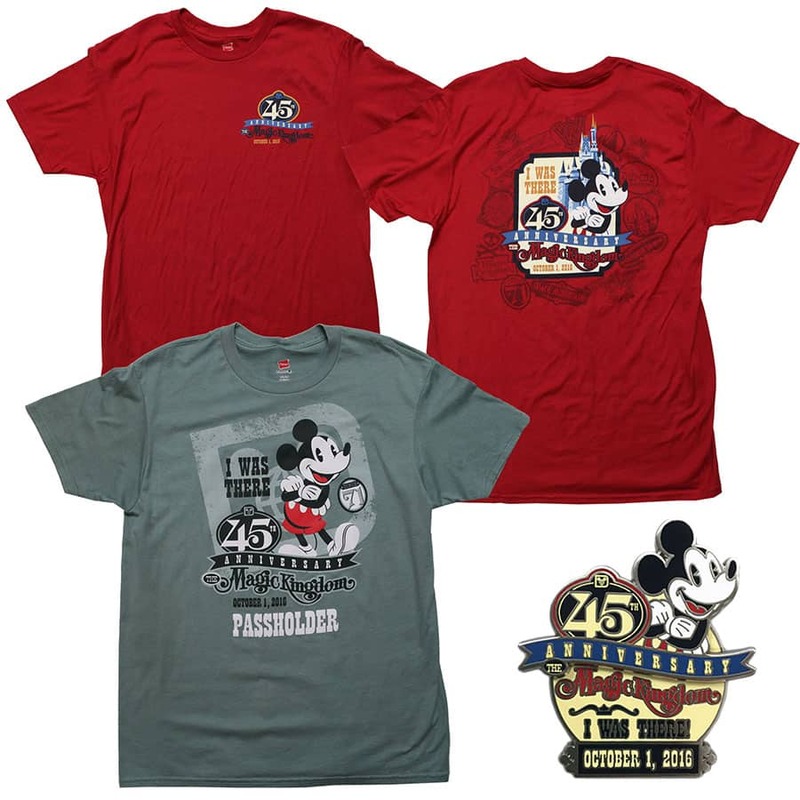 The logo shirts and attraction shirts shown above were created for the Disney Parks online store. 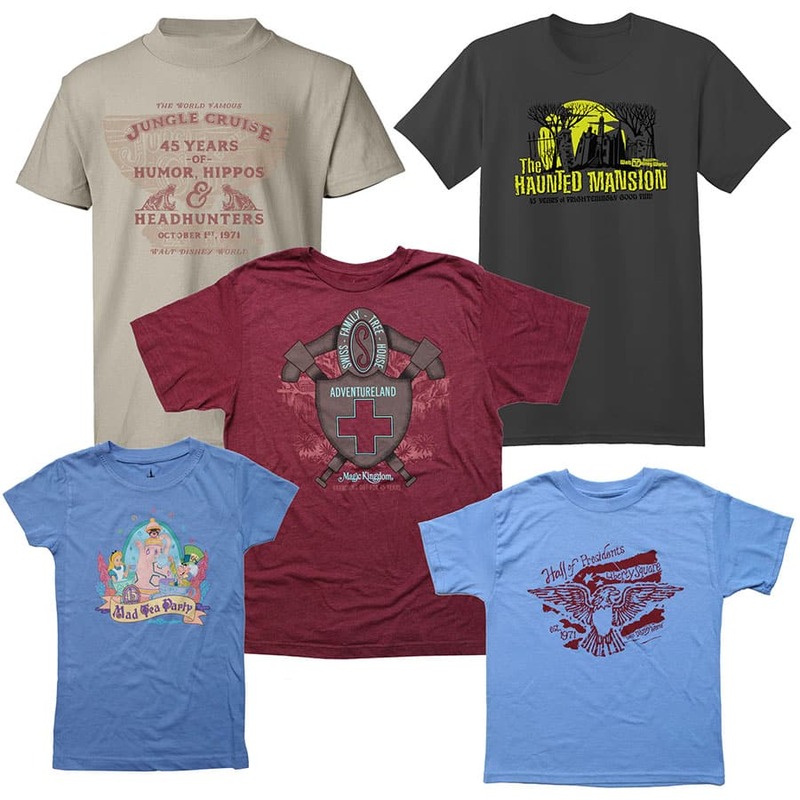 Look for them from October 1-9 at http://www.DisneyStore.com/ParkEvents. The “I Was There” shirts will be released on October 1. Will the most of the items be available in Feb 2017??? Hi Steven, I will be staying at Disney world next week and will be in the park on October 1st I was wondering are the pins & magic bands sold on a first come first serve basis or will there be any type of wrist band allocated to purchase these items? A big thank you, as always! @Jennifer – The “I Was There” pin will be released on October 1. It has an edition size of 3,000 and will be sold on a first come, first serve basis. Availability of the pin will depend on how popular it is with guests on October 1. Based on previous experience, my gut tells me that it’s highly unlikely it will still be available on October 29. Nevertheless, I hope you have wonderful birthday. Magic Kingdom is a fantastic place to celebrate! I’ll be at the Not So Scary Halloween party Sept 30th. Will the Oct 1st release items be availavle? @Scott – The items planned for October 1 will be released on October 1. There are no plans for an early set for those items. I’m sorry I don’t have better news for you. Once again, Steve, you have given us some great information. Can’t wait to arrive on 30th Oct and get some 45 birthday merchandise. Really looking forward to. You’re the best! We are in Disney until Sept 21! Is there anyway to get the I Was There Pin in any other way except for in the park? We leave on Sept 22 and wont be at the park that day. @Amy – The “I Was There” items will be released on October 1. There are no plans at this time to release them earlier than that date. Hi, Steve! Thanks so much for all the fantastic info. Two questions, if you don’t mind? Do you happen to have pricing for the Pandora charm? And, do you happen to have images of the Magic Band? Thank you, and have a Magical Day! Is the “I was there” pin the only limited edition pin em being released on October 1? @Daniel – The only pin being released on October 1 is the “I Was There” pin. The other pins will arrive in locations on September 22. Most of those pins are open edition or limited release. Will we see the 45th Earhat aswell on September 22nd? I’ll be at the parks October 12-18. Will the anniversary merchandise still be available? I turned 45 myself last week and want to celebrate being nearly the same age as Magic Kingdom. @Melissa – Happy belated birthday! The majority of items are considered logo products for Magic Kingdom Park. They will be carried throughout the upcoming year. You should be able to find select items during your visit. I hope you have a great trip! How long will these items be available for purchase in the parks? @Natalie – For the majority of items, they are considered logo products so they will be carried throughout the year. For some of the limited edition items (“I Was There” Pin, retail MagicBand), it will depend upon how popular the items are with guests. My parents were married on October1, 1971! They honeymooned at Walt Disney World. They saw Julie Andrews filming the opening day special, I have their left over coupon booklet! I hope to but them something special to celebrate their 45 years also! @Jennifer – Wow!!! Please send my congratulations. That grand opening special with Julie Andrews is incredible! How lucky they were there. Hey Steven – You mentioned that many items will be sold at the Emporium on October 1st (including a MagicBand, pin, etc). Will these be available on the Shop Disney Parks app at all, or are these in-park exclusives only? @Ethan – Select items will be available via the Shop Disney Parks app starting September 22. As of today, I do not have a list of which items will be available via the app. The majority of items, however, are considered logo items and will be carried throughout the year. Any chance there will be a 45th magiccband? @Matthew – We will have limited edition retail MagicBand (edition size 4,500). Will items post to the app on 9/22 as well? I know on your last post you mentioned there would be a final look at items in a September post..is this it? Still wondering if there’s a fleece throw, snowglobe, or deluxe print based on the main artwork. @Jonathan – This is the final look article I previously mentioned. I’m not aware of the additional items you mentioned. 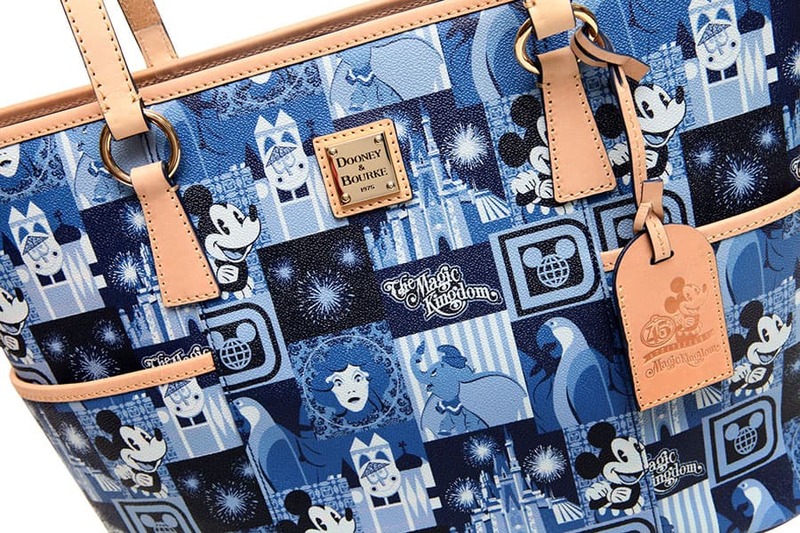 Select items may be found on the Shop Disney Parks app on September 22. Hi Steven, love the 45th anniversary merchandise! Especially that Haunted Mansion t-shirt. 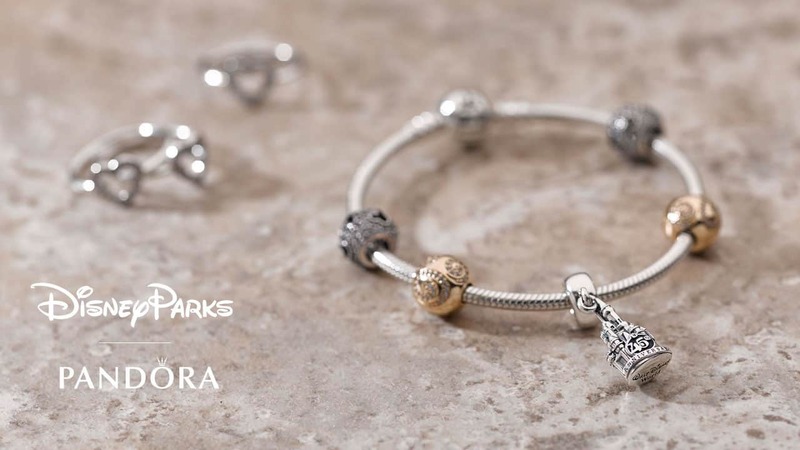 Will there be any additional Disney Parks Pandora charms released this Fall? It’s been awhile since there’s been any new charms.